While every dog loves a good park to run around in, we Floridians take dog parks to a whole new level – with dog beaches! Just picture it: dogs running freely along the beach shoreline, kicking up sand as they joyfully chase one another, and dog paddling their way through the clear blue ocean. It’s a magnificent sight to see. And with almost 1,200 miles of sandy coastline, Florida offers more than 25 different beaches for dogs and humans alike to enjoy the sunshine and ocean air together. So, as a native Floridian, it’s safe to say I’ve been to my fair share of dog beaches along the way. While I generally like to think of my pupper as a relatively low maintenance dog, beach days are a completely different story. Just like humans have to pack extensively for a beach day (think sunscreen, towels, snacks, water, beach toys, and so on), our doggos also need supplies to make their trip to the dog beach both safe and enjoyable. Thinking about trekking to a dog beach in the near future? Well, then I’ve got the perfect thing for you: the essential packing list for a day at the dog beach! This is my personal number one item to pack for myself when going to the beach, and it’s also a good idea to make it one of your top items for your dog. You may be surprised to learn that, like humans, dogs can get sunburns. Dogs with light skin or white fur or hair are more susceptible to sunburns, but all dogs can get them on more sensitive areas like their nose, tips of the ears, belly, and groin. However, be careful when using sunscreen on your pup – only use sunscreen that is designed specifically for dogs (you can consult with your veterinarian on this to be sure). Traditional human sunscreens should not be used on dogs, as they contain toxic chemicals like zinc oxide and para-aminobenzoic acid (PABA). An alternative way to protect your pup (and yourself) from the harsh rays of the sun is to bring along a large umbrella. Not only will it help shield you from sunburns, but it also serves as a cool, shaded area for your dog to cool down under if they become overheated. Most beach umbrellas are lightweight, easy to pack and set up, and don’t take up a lot of room in your vehicle (or storage in your apartment) – so bringing one along is a no-brainer! Another sun protectant that has been getting a lot of attention recently is dog sunglasses. No, this is not when your Dad puts his own sunglasses on your dog as an embarrassing joke. But yes – they are as goofy-looking and adorable as they sound! I don’t know why, but I can’t look at a picture of a dog in sunglasses without smiling – it’s just so cute. My favorites are Rex Specs, which actually calls their products dog goggles, because they are exactly that. Originally designed to protect the eyes of working and adventure dogs from the sun and debris, these goggles can be used in the water and along the beach. But be mindful that while they are designed to drain, they are not watertight – so check on your pupper to make sure they can see! While sunscreen is my personal number one item to pack for the beach, a dog lifejacket is my absolute number one item for my Boxer girl Bailey. That’s because I used to think swimming came naturally to all dogs – turns out, it doesn’t. The first time we put our Boxer girl in the water, she sank like a rock. We tried to teach her, both in a pool and at the beach, pedaling her little paws for her to show her what to do – but no luck. After some online research, I discovered that it is actually very common for Boxers to not be able to swim. Because of their short muzzles, it’s difficult for them to keep their nose and mouth above the water. So, they must tilt their heads up, causing their back ends to tuck and sink. Hence, the lifejacket! If you’ve got a non-swimming dog like me, or a newer pup that you’re not sure is a strong swimmer – a lifejacket will definitely come in handy at the dog beach. If it’s too hot for your feet – it’s too hot for their paws! Under the shining Florida sun, the sand can get h-o-t, HOT! Because of that, we always pack a beach blanket (in addition to the towels we bring for drying off). This gives our pup a cooler place to lie down, and protects her belly from the burning sand. Our outdoor blanket from Bed, Bath & Beyond has lasted for years and we absolutely love it. Any sand just rolls right off of it, it’s got a convenient strap and zipper making it super easy to pack up and carry away, and it’s machine washable! Accidents can happy anywhere, including at the beach, so it’s important to be prepared. You can purchase a premade dog first aid kit, or you can assemble one yourself using items you likely already have in your home. Some important things to include: your pup’s medical records, gauze, hydrogen peroxide, antibiotic ointment, your dog’s medication, and an extra leach and collar. The American Kennel Club has even more recommendations for what to include in your dog first aid kit here. Your dog needs water when outdoors. Yes, it’s straightforward, but we felt it too important not to mention. While traditional dog parks usually have low water fountains for dogs to drink from, the same is not always true for dog beaches. Better to be safe and bring your own supply of water for both yourself and your pupper, so everyone stays hydrated! We like to bring a collapsible rubber bowl too, to make it easier for our Bailey to re-hydrate. We thought this would be an absolute necessity for all dog parents whenever they are away from home, but we have on occasion come along pawrents who accidentally forgot their waste bags at home. Hey – s*** happens, right? You never know when your pup will need to relieve themselves, so always keep a few bags on hand while at the dog beach – not only for you, but also to offer to any of your forgetful fellow beachgoers. Because dog waste on the beach is fun for no one! Toys and the beach go hand-in-hand. We humans can use them to build sand castles or play a fun game. And our dogs can too! Well, except maybe for the sand castle part, not having thumbs and all. But just because your pup doesn’t have opposable thumbs, doesn’t mean that they should miss out on the fun! Pack a toy that floats well, such as a Frisbee or tennis ball, to keep your pup engaged and having a great time during their dog day at the beach! For puppy baby mamas who love a fun day out in the sun, dog beaches are a great, guilt-free way to have your beach and your pupper too! By planning ahead and packing these essentials, you can make sure you’re fully prepared for whatever the beach throws at you – so all you have to do is relax and have a great day! And since I’m always on the hunt for new dog beaches to check out, I’d love to hear from you! 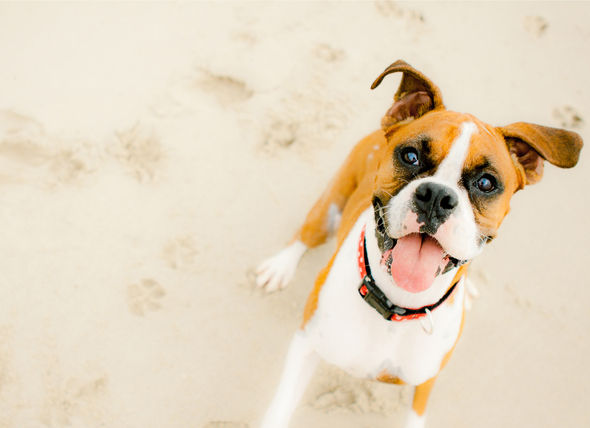 Tell us about your favorite dog beach in the comments below!